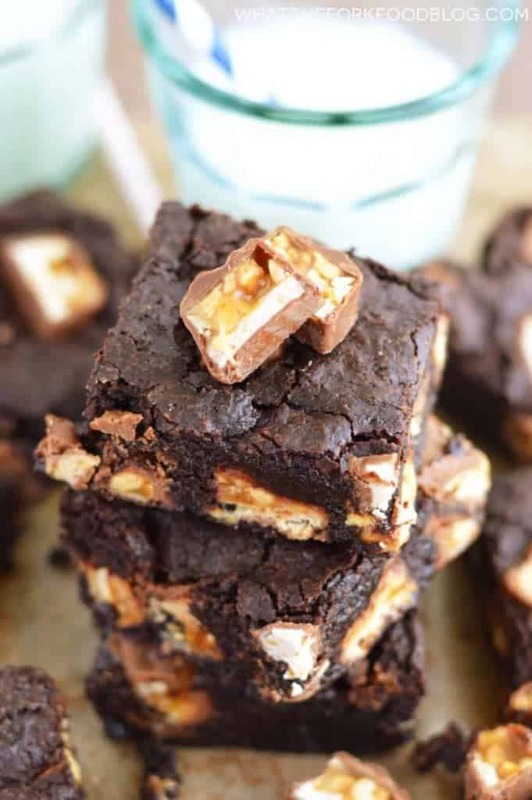 Thick, rich, chewy Snickers Brownies make a decadent dessert that’s quick and easy to make. They’re the ultimate combination of brownies and candy. I’ve had some fun-sized snickers bars hanging around my house for a while now. Part of me wants to say they’re leftover from Halloween and the other part of me doesn’t want to admit that. Since they clearly weren’t being eaten as is, I thought I’d throw them into a dessert to use them up. How do we make candy seem more appealing? Put it on a brownie. Brownies just seemed to be the perfect vehicle for those little Snickers bars begging to be eaten. 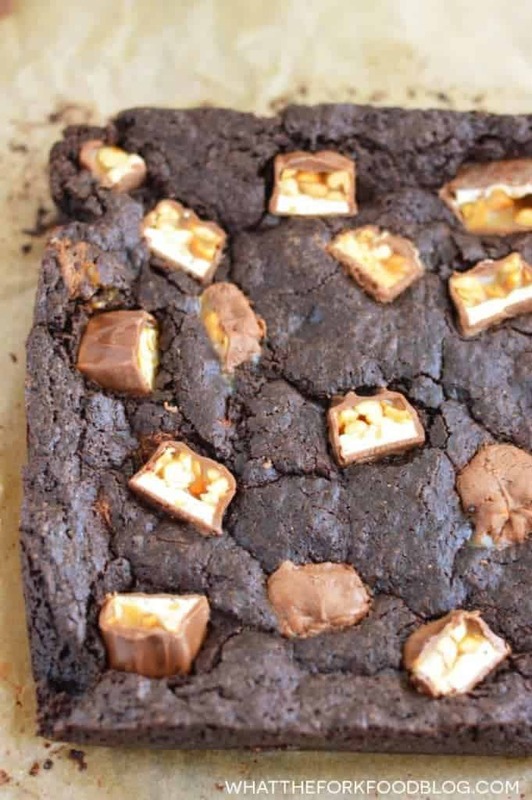 I mean really, could there be anything better than brownies studded with sweet, crunchy, caramel-y candy bars? No. Snickers brownies, you have ZERO competition. Speaking of competition, I’m having ANOTHER giveaway! Since What The Fork Food Blog is now 2, I thought two giveaways seemed appropriate. Today’s giveaway is for some of my favorite Rodelle vanilla products – vanilla extract, vanilla beans, baking cocoa, and almond extract. You can enter the giveaway with the giveaway form below the recipe. Good Luck! 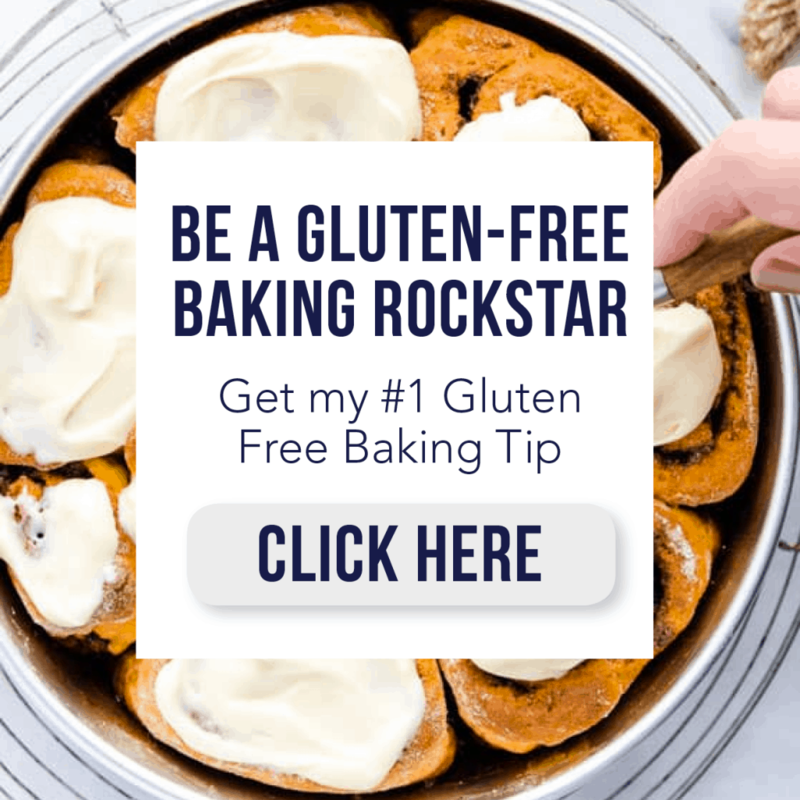 The first giveaway can be found below my gluten free meyer lemon bread recipe. That giveaway is for a Le Creuset Signature Saucepan so don’t miss out on that! Before you get to the recipe, I just want to let you know that these brownies would make fabulous brownie sundaes. Pile them high with with vanilla ice cream, chopped snickers bars, and a drizzle of chocolate AND caramel. Now, tell me – what’s your favorite way to eat brownies – fudgy, chewy, cake-like, in ice cream, covered in ice cream, by the pan-full? Enjoy! 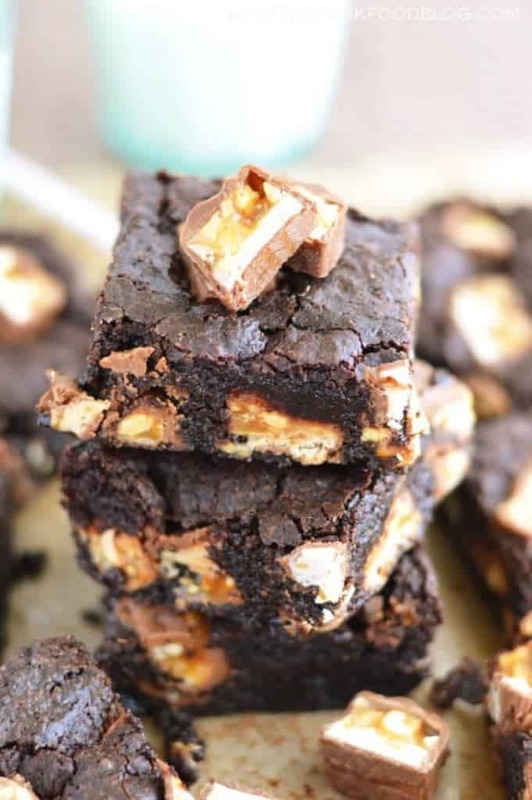 Thick, rich, chewy Snickers Brownies make a decadent dessert that are quick and easy to make. 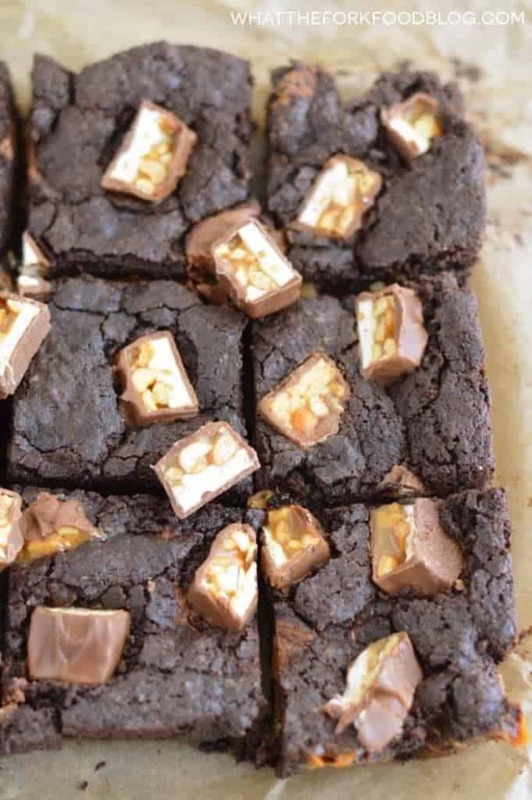 They’re the ultimate combination of brownies and candy. Preheat oven to 350 degrees and line an 8x8 inch baking dish with parchment paper. In a large microwave safe bowl, add the butter and sugar and heat in the microwave until the butter is melted. Stir to combine and add the cocoa powder and oil, mixing well to combine. Add the eggs, egg yolk, and vanilla and beat the egg to incorporate. Then mix in the flour, baking soda, salt, and cornstarch. Stir in the Snickers bars and transfer the batter to the prepared baking dish. Bake at 350 degrees for 30-35 minutes or until just done. Don't over bake! Cool completely before cutting. *I used Bob's Red Mill 1:1 Flour which contains xanthan gum. If your mix does not have xanthan gum, you'll have to add some. When my brownies came out of the oven, I added additional chopped Snickers bars - I just pressed them into the slightly cooled brownies. Follow Sharon | What The Fork Food Blog’s board Cupcakes, Cookies, Bars and Brownies on Pinterest. These look like amazing chocolatey deliciousness. Snickers are one of my all time favorite candies, definitely pinning this for later! Holy moly this is incredible! I want these! Brownies for me have to be chewy and moist and eaten with a fork or spoon! Your blog is so dangerous. Haha! These look delicious, Sharon! Brownies are my FAVORITE ever and these look awesome! 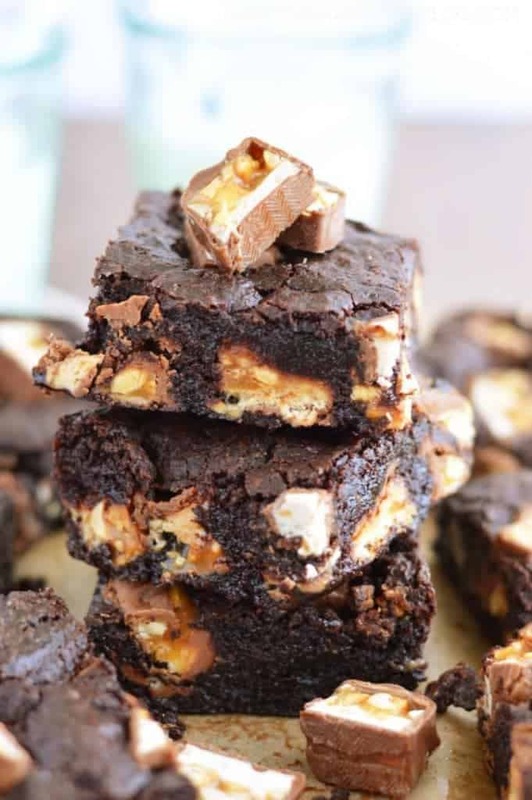 Words cannot describe how badly I want these snickers brownies (right now!). Yum! I am all about fudgy brownies. I LOVE the snickers. 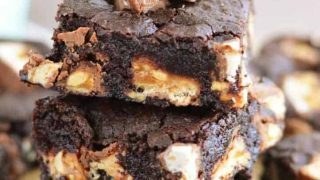 These truly look like EPIC brownies! How amazing are these!! I loooove snickers and you’ve added them to brownies. Win win. Wow those brownies look so decadent! My husband would love them! Yum! My mouth is watering! These look incredible! These look amazing! My favorite way to eat brownies is most definitely with ice cream! yum! HOLY YUM. These look DIVINE. Decadent brownies are totally my thing. 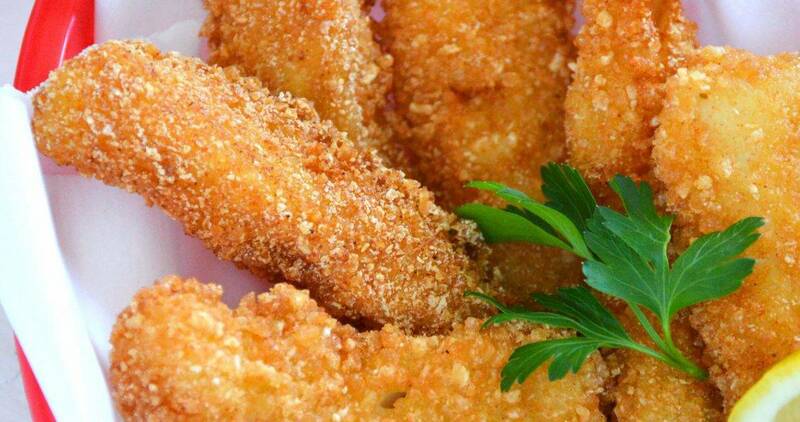 These look like heaven, and I can not make them fast enough! Fudgey all the way for me, although I will never turn down chocolate-flavored-anything with Snickers in it haha! Brownies are my family’s favorite. 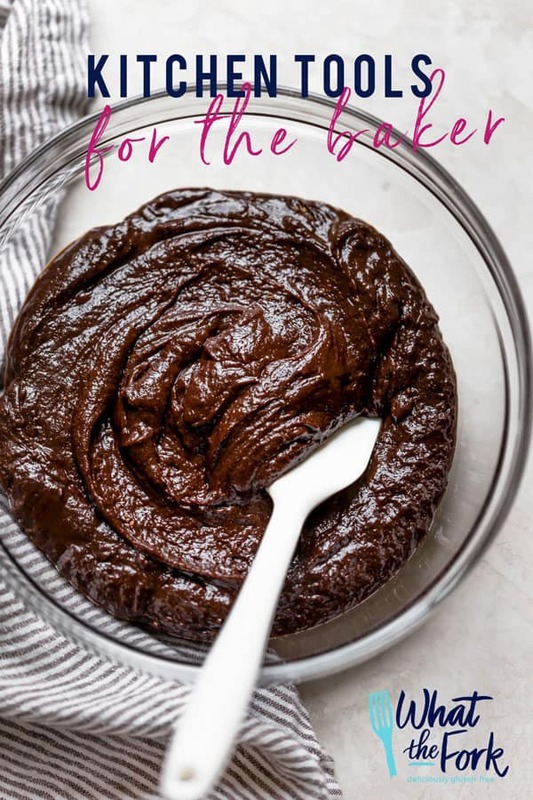 I love to prepare them cake-like and fudgy. 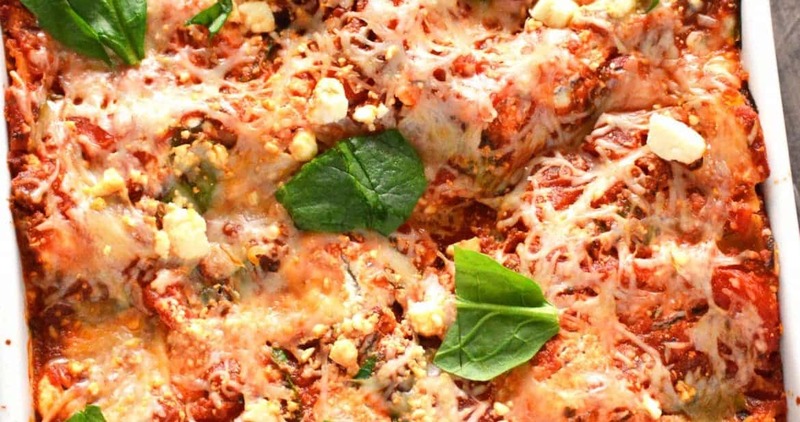 Yours look really delicious and thanks for sharing the recipe. I look forward to preparing them for my family. Thanks for the chance to win. You’ve taken homemade brownies to a brand new, delicious level. I had to look away, but I just couldn’t resist! These look great! Seriously, I didn’t know a brownie could get better! I’m a fan of the fudgy brownie! They were leftover from Halloween? Did I read that right? That would NEVER happen in my house. I would eat them all. No willpower. There is never any leftover candy here! LOL I will gladly buy some though to make these scrumptious looking brownies! I’m a fan of the fudgy textured brownie, the darker the better with a bit of espresso powder. My favorite are chewy and I love the edge pieces when they get crisp and crunchy. These brownies looks so delicious! I love rich, chewy brownies. I’ve read that while Snickers are gluten free some cross contamination can occur during seasonal months when they are meeting supply and demand. Always good to read the labels during the holidays. May favorite brownies are cake like, Thanks for the chance. I love fudgy, chewy brownies. I like a cake like brownie the best. Oh my! Yes! These brownies look so delicious! A) Can you be my mom and make these for me? B) I have a bag of coconut sugar I bought for a recipe and now I have no idea what to do with. Do you know if I could use it in these in place of the cane sugar? Visiting from the awesome Buns in my Oven. LOL 2 kids is enough for me ???? As far as coconut sugar goes, you can use it but it will give it a slightly drier texture but not to the extent that coconut flour will. These are pretty fudgy/chewy so it shouldn’t be enough to make it too dry. You could always add 1-2 tablespoons of water though to offset that.